Get inspired and unleash your inner creativity with Europa Essentials Pure Organic Coconut Oil, the perfect base oil carrier for turning your essential oils into your own massage oil perfections. One of the most versatile oils, coconut oil can also be used as an oral detoxifier pull or as a beauty base on your face to help reduce the appearance of fine lines and wrinkles. Other uses include moisturizer for your skin, hair and nails. It can help with problem areas caused by exzema, dry skin or dandruff, and is also the ideal versatile oil for do-it-yourself projects and gifts such as making your own shampoos, conditioners, moisturizers, lotions & lip balms. 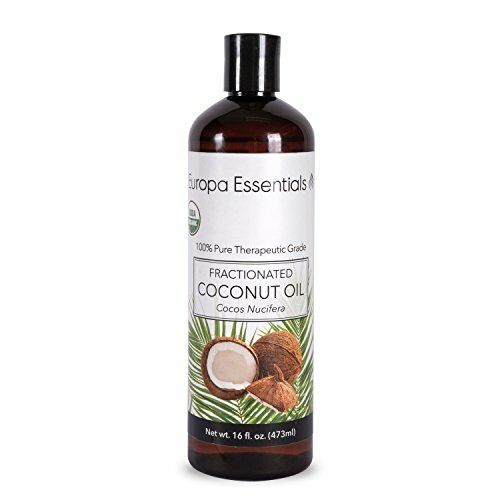 Non-greasy and lightweight, discover all the benefits of Europa Essentials 100% Pure Organic Fractionated Coconut Oil. If you have any questions about this product by Europa Essentials, contact us by completing and submitting the form below. If you are looking for a specif part number, please include it with your message.